How does Facebook get agencies to ramp up advertising beyond targeted banners? Create an awards program. Earlier this year, the social networking giant launched Facebook Studio, a hub showcasing examples of high-impact campaigns on the site and providing resources for advertisers to build out their Facebook strategies. • Is the campaign social? Are people and social interactions at the core of the idea? Does it motivate people to share? • Does it make full use of Facebook marketing products? 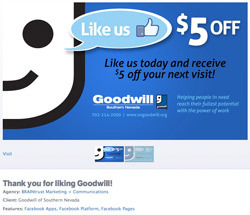 Does the campaign take advantage of Facebook’s full potential? • Does it integrate with other media? Is the Facebook idea part of a larger multimedia campaign? • Does it scale? Is it easy for people to interact with and share your content? When it comes to “taking advantage of Facebook’s full potential,” that likely means the more Facebook marketing or ad offerings -- marketplace ads, sponsored stories, brand pages, applications -- the better. He has also urged agencies to embrace tools like custom applications and brand pages to create more dynamic, engaging campaigns on Facebook. The pitch also serves to deflect criticism about the creative limitations of Facebook’s standard display ad units. Submissions for the Facebook awards are due by Dec. 31, and entries will be judged by a jury of industry leaders from agencies, brands and creative firms to be named in the coming weeks. Winners will be announced in late January. In addition, Facebook Studio has been upgraded to make it easier to browse content and find particular kinds of work. For example, to view all work done for the auto vertical in the U.K., the filter will now show you all examples that meet that criteria. The changes also include a refresh of the main page and an updated agency directory. To date, campaigns from more than 35 countries are represented on Facebook Studio and three-quarters of page views are spent looking at agency-submitted work. A third of visitors spend more than five minutes on the site, according to Facebook.